October 2, 2012 – SOUTH LAKE TAHOE…The Citizens Academy was launched in July 2012 to provide citizens an opportunity to increase their knowledge about the workings of local government and to become more involved in the shaping and development of their community. Nineteen residents participated in six sessions conducted over a 12 week period. Course topics included “City Government 101” which highlighted the city’s history, organization and adopted strategic and business plans. Department heads and staff from Community Services (parks and recreation, snow removal, special events), Development Services (building, planning, housing), Finance, Police and Fire, and Engineering (capital improvement, storm water) all provided comprehensive overviews of the inner working, accomplishments and future plans of their respective departments. 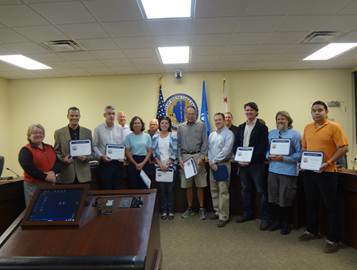 Another graduate, Scott Homolka said, “Thank you all for hosting this exploration of the inner workings of the city. I appreciate the time and effort you and the entire SLT team put into making this such a great experience,” said academy graduate. The City congratulates to graduates: Bonnie Turnbull, Chris Beni, Eoin Doherty, Jameson Honeycutt, Josh Hempel, Perry O’Bray, Philip Armstrong, Ruben Zepeda-Raya, Russ Dahler, Ryan Payne, Shawn Kearney and Scott Homolka. The South Lake Tahoe Citizens Academy is a free, six session interactive course designed to provide residents with an in-depth look into municipal government, as well as, information about the services and programs of the City of South Lake Tahoe. The next academy will be offered in Spring 2013 with the date to be determined. Visit the city’s webpage at www.cityofslt.us/academy for updated information.